Home Food Trucks How Did We Like Our Grilled Steak Tacos at Taco Bite ? How Did We Like Our Grilled Steak Tacos at Taco Bite ? Taco Bite has only been around since the end of the summer, but they have a good following, and deservedly so. While their taco fundamentals are solid, it’s their sauces that keep us coming back for more. We felt for Grilled Steak Tacos. For this visit, we ordered grilled steak and grilled chicken tacos. At $3 each, we like getting lunch for $6 too. In addition to serving good food, they are good people. Taco Bite was one of the NYC food trucks regularly trekking out to those areas hardest hit by Hurricane Sandy. When we say their taco fundamentals are solid, that means 2 soft corn tortillas per taco, raw onions, fresh cilantro, limes, radishes, and decent meat for the fillings. The first taco we ate was the grilled steak tacos. You can get any sauce you want, but we leave it to the chef to decide for us. They know which sauce go best with which filling. The grilled steak tacos came with chipotle mayo and picante rojo sauces. Make sure you like some heat if you get the picante rojo sauce, because that sucker was scorching! 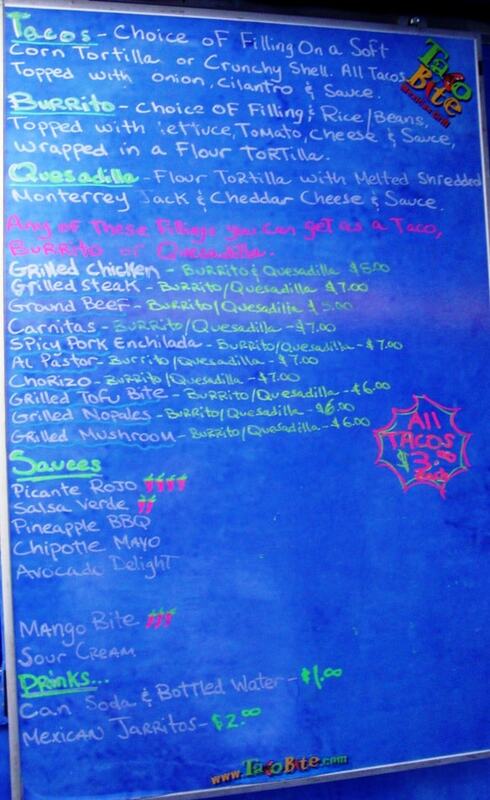 Taco Bite helpfully puts chili pepper ratings on the menu, and the picante rojo sauce has 4 chili peppers. That’s the hottest they serve. The steak was tender and well seasoned, standing up well to the picante rojo. The chipotle mayo was a tiny bit spicy, and added some creaminess to the taco. Moving along to the grilled chicken taco, things were noticeably more subtle. The pieces of chicken were nicely marinated and grilled to perfection. Each piece of chicken was juicy and flavorful on its own, but the avocado crema was a choice addition, complementing the chicken, as it should. Raw onions added a little edge, and the radish added some crunch, but the overall vibe of this taco was cool and creamy. The grilled chicken taco with avocado crema may be more of a summer taco, but we were happy to eat it in winter too. Taco Bite gets around to different areas, so check their twitter here or our Mobile Munchies twitter feed to find out their exact location. Once you’re in the general area, their bright blue truck is easy to locate. Eddie's Pizza will be opening a permanent cart next week near 72nd St & 3rd Ave. They expect to permanently serve dinner at this cart. With all the troubles food trucks are having with the police, restaurants and building owners, maybe gourmet food carts are the way to go!